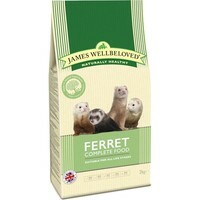 James Wellbeloved Complete Ferret Food is a perfectly complete, dry food that has been expertly formulated to meet the specific dietary requirements of Ferrets. James Wellbeloved understand the higher energy needs and carnivorous diet of Ferrets and offers a food that is rich in protein sourced from high-quality turkey meat. This nutritious food also contains a natural source of M.O.S (Manno-Oligo-Saccharides) which promotes the immune system and maintains the healthy balance of bacteria present in the large intestine. The whole ground linseed, also present in this food, promotes a soft, shiny coat. I have had the pleasure of owning ferrets for many years and this food is excellent. It is in my opinion the best ferret food on the market. If you keep ferrets this food is a must.